All the holiday flavours with little effort. I came up with this recipe back in 2012 as an holiday alternative for people who might not want to roast a whole turkey. 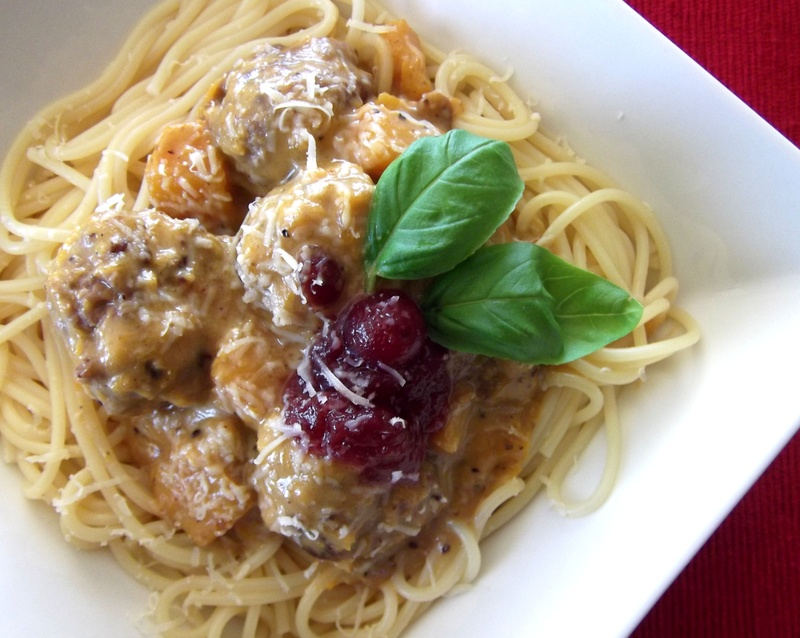 You could also make a variation using left-overs rather than turkey mince (ground turkey). This would also be delicious if you want to substitute zucchini noodles for the spaghetti. Put the turkey, onion, breadcrumbs, garlic and a good seasoning of black pepper in a large bowl and use your clean hands to mix. Form the turkey mixture into meatballs. You will get about 24 meatballs (slightly smaller than golf balls). Put the meatballs on a plate, cover with cling wrap and refrigerate, ideally for at least 30 minutes (or overnight if you are making in advance). Heat the olive oil in a large deep frying (or saute) pan for which you have a lid. Add the diced butternut. Cook over a medium heat for 2 minutes or until the butternut just starts to soften around the edges. Remove the butternut to a plate. Add the meatballs to the pan and cook for 6-8 minutes, turning often until browned all over. Return the butternut to the pan and then add the chicken stock and cranberry relish. Stir to mix the relish into the stock. Bring to the boil, then lower the heat, cover with the lid and simmer for 8 minutes. Meanwhile, cook the spaghetti in a large pan of salted boiling water according to the packet instructions (about 7-8 minutes). Remove the lid from the meatball pan and simmer for another couple of minutes. The butternut should be starting to break up a little – don’t worry, this will help thicken the sauce. Stir in the cream, season with a little extra black pepper and then remove from the heat. 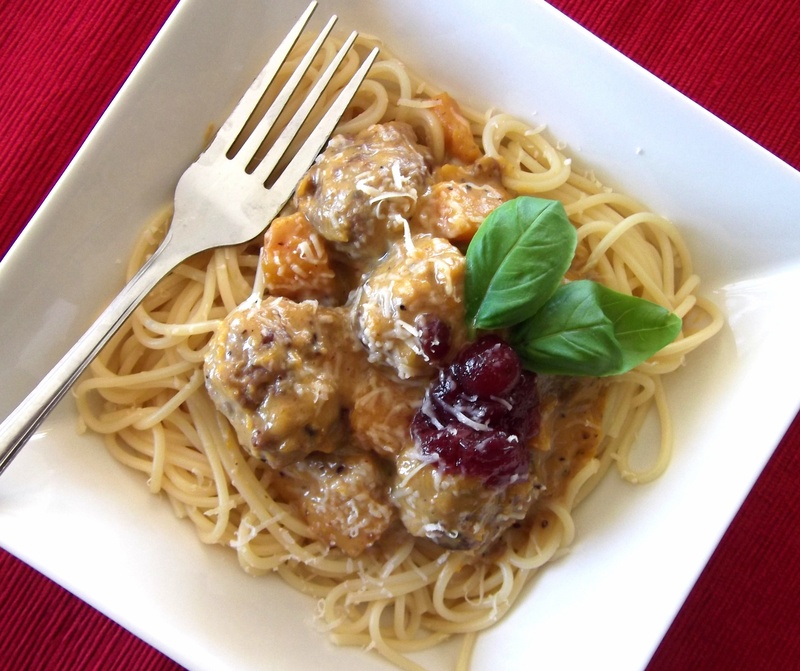 Serve the spaghetti topped with meatballs and sauce, plus finely grated parmesan and a teaspoon of extra cranberry relish. Add a couple of fresh basil leaves if you have them. This entry was posted in Mains and tagged Alternative Thanksgiving, Cranberry, Food, Holidays, Pasta, Recipe, Recipes, Thanksgiving, Turkey. Bookmark the permalink.